“If you’re reading these words, perhaps it’s because something has kicked open the door for you and you’re ready to embrace change. It isn’t enough to appreciate change from afar, or only in the abstract, or as something that can happen to other people but not to you. 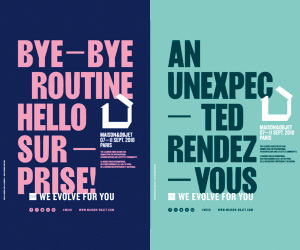 We need to create change for ourselves, in a workable way, as part of our everyday lives.” So says, Sharon Salzberg, a well respected meditation teacher and author. Creating change for is a stepping stone towards a future which can possess the innate ability to be a symbol of enduring hope, colour and life. Imagining a world (not so far away in the future) with very few and limited resources, a world where natural calamities and diseases are the order of the day is also not hard to envison. The structure composed of bamboos of varying heights and thickness, allows the temperatures within to remain cool and also facilitates an abundant supply of natural light. But then again, trying to ensure that the earth doesn’t fall victim to its inhabitants’ errors could be a baby step in the right direction. When Nehru said “learning is a never-ending process”, he meant business. Sitting pretty in the picturesque and beauteous surroundings of a former fruit orchard, the Panyaden School contracted Chiang Mai Life Construction and the firm 24h to design its environment-friendly school buildings. The school integrates Buddhist values and environmental awareness with a modern and singularly bilingual curriculum. Upon setting foot onto the campus, one is immediately taken in by the sheer natural beauty that is presented by the opulent panoramas across the area. 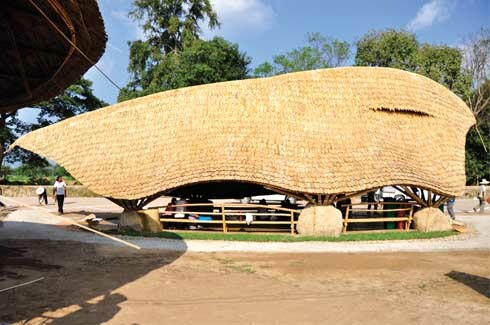 Designed on the basis of the “antler-fern leaf” structure, the buildings are made from naturally sourced materials and locally procured labour. What has resulted is a self-sufficient, sustainable and low environment impact facility. Think of George’s tree-house in George of the Jungle! Treated bamboo rods of varying thicknesses and heights have been used for columns and also make up the entire roof structure. ‘Borax treatment’ is applied to the bamboos to keep them insect free; borax is a natural salt and is thus environment friendly. 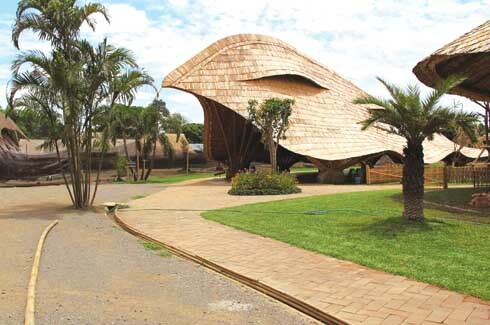 The bamboo roofs are further protected from the rain with the use of a mixture of oils. A special thick coating of viscous liquefied rubber has also been applied to the bamboo for further insulation. A small playground – simple, natural, yet wonderfully inviting. The structures, which are geometrically sound, are fitted into large rock foundations in the ground. 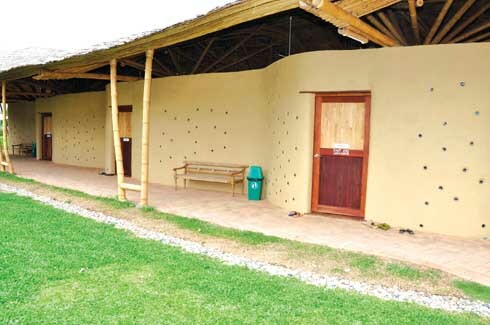 The classrooms are all but immersed in natural light, with the walls constituted out of compressed earth (adobe earth – a mixture of clay, rice husk and sand) and fitted with “glass windows” which are really glass panes obtained from defunct washing machines. Large canopies over all the rooms allow for a well-shaded, perfectly ventilated and comfortable learning environment. 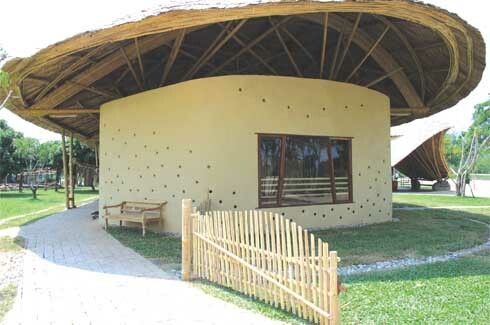 The classrooms of the Panyaden School are built and designed in such a way that air is conditioned naturally. Day light which infiltrates into the classrooms, brings along with it cool, fresh and healthy air. Thus, the school in turn consumes very little electricity. The antler-leaf structural design is clearly visible in this shot. Rammed or compressed earth is ideal for hot and arid temperatures, because of its great capacity to store heat in the day and release it in the night. It is thus perfect for the weather conditions found in Chiang Mai. This energy-saving feature is one of the main reasons why the architects opted to build the classrooms of the school using this technique. 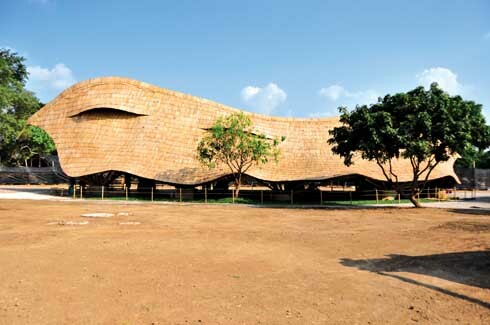 Almost every structure has been rendered an organic shape created with a natural material palette. 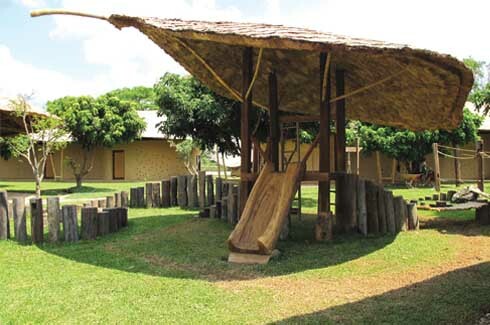 This is a clever way of bringing the children closer to nature, in a serene and calm atmosphere, in the midst of an agricultural cornucopia and stimulating topography. The Panyaden School is equipped to collect, manage and recycle waste water. The school grows its own crops and is also a producer of bio-gas. The curriculum drives home the necessity of “Reduce, Reuse and Recycle”. Many activities that uphold these three “green words” are organised by the school on a regular basis. 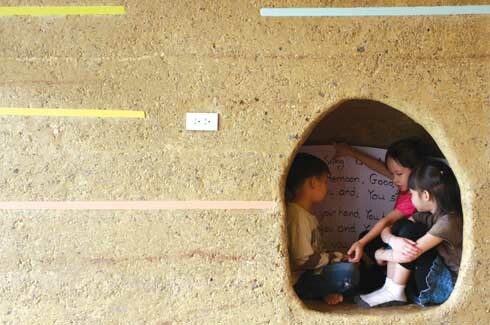 Cocooned, protected, nurtured…a not-so-typical classroom at the Panyaden School; yet there is a place for everyone! The school, through a blend of Buddhist principles and an informed ecological sensitivity, educates its multicultural students with a bilingual curriculum that not only covers the de rigeur subjects, but also lays heavy emphasis on social and human sciences, in order to help inculcate healthy living habits. The school is a children’s paradise, designed to provide a place for them to play, eat, discover, share, watch, laugh and learn – all this while being infused with an environmentally friendly sensibility and creating a significantly low carbon footprint. An office building, with recycled glass embedded into the walls for windows. The school and the architects behind this self-sustaining piece of ingenuity have received numerous accolades and awards for their green architectural design. We are all born with the vision to build a powerful future that can withstand everything. But how often do we stop to think if we could ‘re-build’ a future which is self-sustaining, environmental friendly and enduring? The Panyaden School has indeed taken multiple steps in this direction. It is not just imperative to academically nurture and condition the minds of the future generations, we also need to endorse and enforce a certain degree of responsibility towards our planet. We owe at least that much to posterity!